(16) Photos Printable Brochure Apply For Credit Schedule A Test Drive Text Us Now! 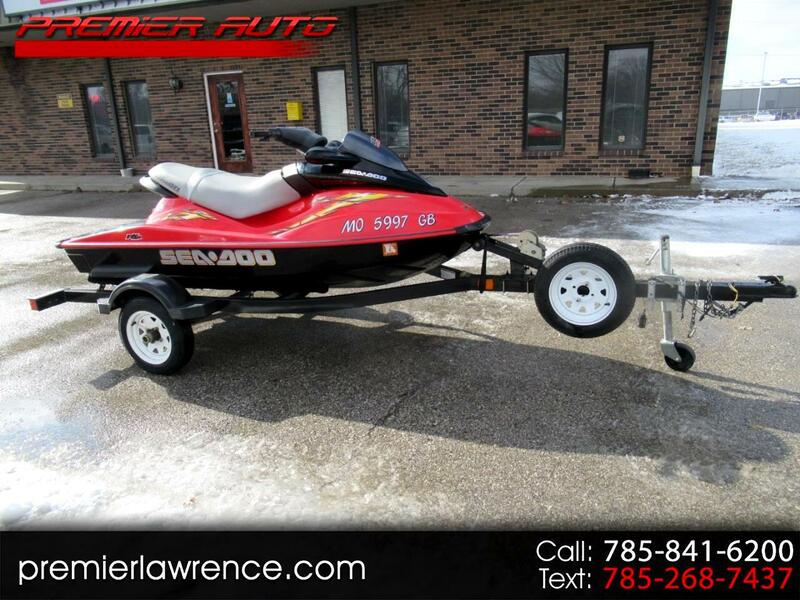 2003 Seadoo Bombardier RXDI. 150 total hours, and top end of the engine was replaced at 136 hours. This Seadoo is in top notch condition. 62mph on the water and has more than enough power for tubes or anything else. Comes with a trailer, cover, learner's key to limit it to 35mph, and a regular key. New starter put on 9/7/17. Runs like a champ and is a lot of fun. Please call with questions. Celebrating 11 years of serving our customers. As of 1/7/19 we now have locations in both Lawrence and Topeka. Financing available for ALL TYPES OF CREDIT with rates as low as 3.99 with approved credit. GAURANTEED CREDIT APPROVAL on most vehicles regardless of credit history. Free Carfax report on every vehicle. We welcome your trade-in and we are available to schedule appointments in the evenings or on weekends to work around your schedule. No games, no gimmicks, no hassles or pressure… just nice cars at great prices and a no pressure experience. We want the opportunity to earn your business the first time, after that we know you will be back. Don’t take our word for it look at our reviews. Please call or email us to confirm location and availability of the vehicle you are interested in. You can also visit us online at www.premierlawrence.com or www.premiertopeka.com. All vehicles come with a minimum of a limited power train warranty. We also have very competitive service contracts available on every vehicle. The advertised price does not include a $199 document fee and sales tax, where applicable. Visit Premier Auto online at www.premierlawrence.com to see more pictures of this vehicle or call us at 785-841-6200 today to schedule your test drive. All vehicles are subject to prior sale. The advertised price does not include a $199 document fee and sales tax, where applicable. Message: Thought you might be interested in this 2003 Sea-Doo Bombardier.